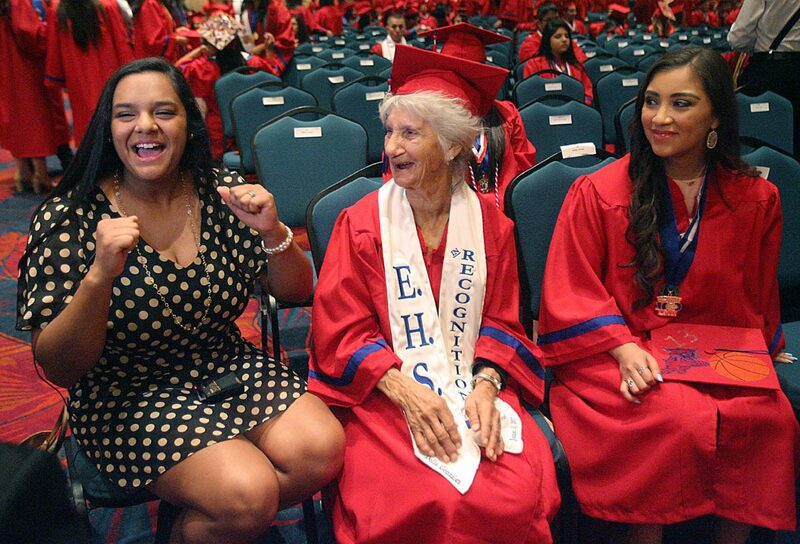 Dolia Gonzalez stands next to her niece Emily Acosta, 17, during Edinburg High School commencement ceremonies Saturday June 3, 2017, at the McAllen Convention Center in McAllen. Dolia Gonzalez was awarded an Honorary Certificate during the graduation ceremonies for the Class of 2017. 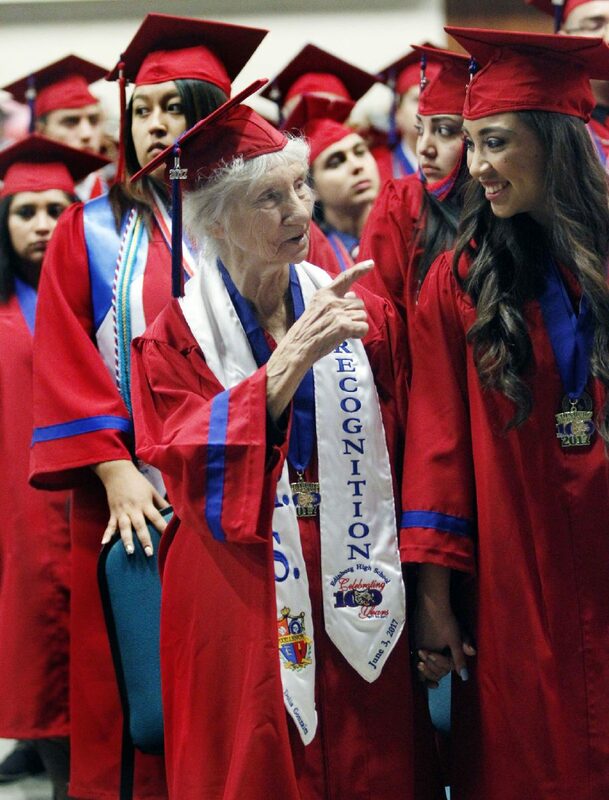 McALLEN — Among the several hundred graduates receiving diplomas Saturday at the Edinburg High School graduation ceremony was one special honoree who never had the chance to get her diploma, but nevertheless has made a lasting impact on the community. Dolia Gonzalez, the mother of U.S. Marine Sgt. Alfredo “Freddy” Gonzalez, was awarded an Honorary Certificate by the Edinburg school district during the ceremony at the McAllen Convention Center. Her son was a graduate of Edinburg High School and joined the Marines right after graduation. During the Vietnam War, Freddy destroyed an enemy bunker and fought back an enemy attack until he was killed. He became a war hero and the beloved son of Edinburg. She said she has long regretted not finishing school and graduating because of family responsibilities. 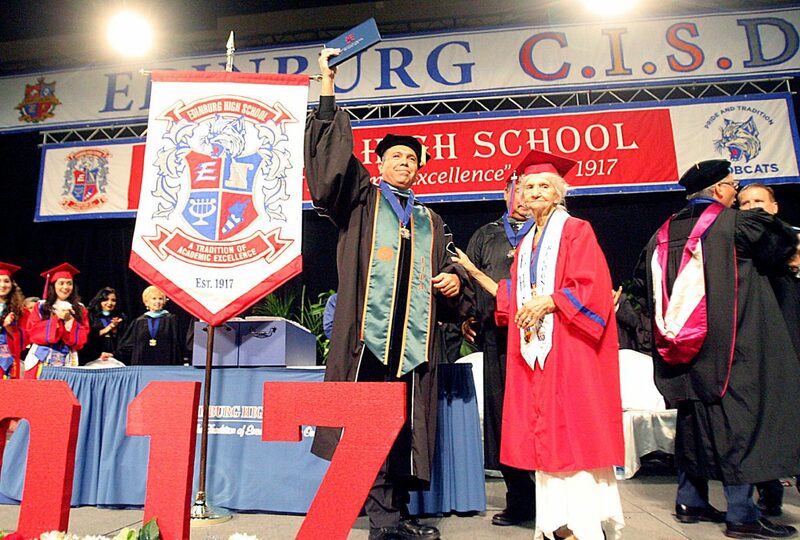 But on Saturday, she finally got the opportunity to don the graduation cap and gown and march along with the Edinburg High Class of 2017. 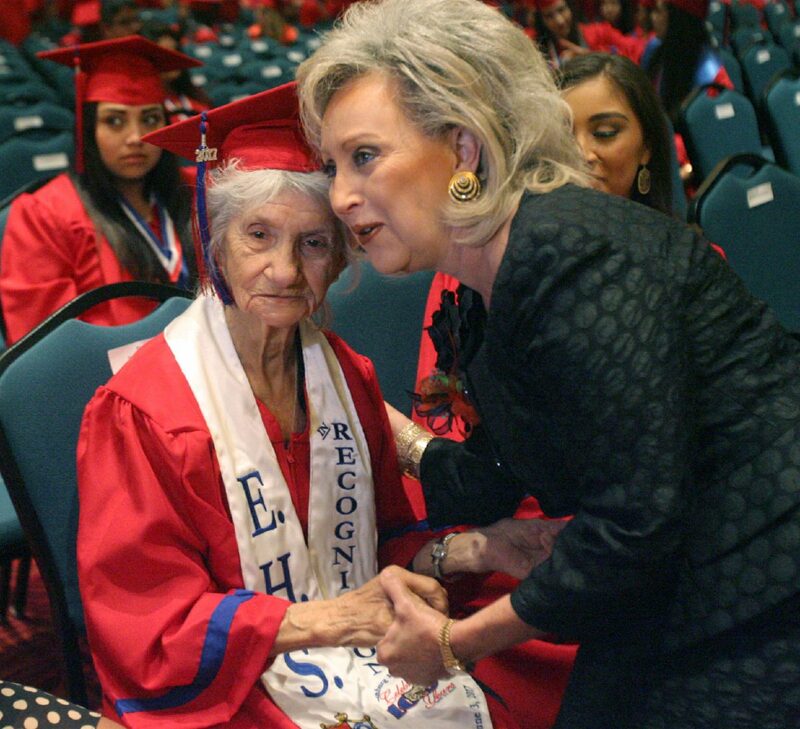 Superintendent Rene Gutierrez raises the Honorary Certificate awarded to Dolia Gonzalez, 88, during Edinburg High School Commencement ceremonies Saturday June 3, 2017 at the McAllen Convention Center in McAllen. 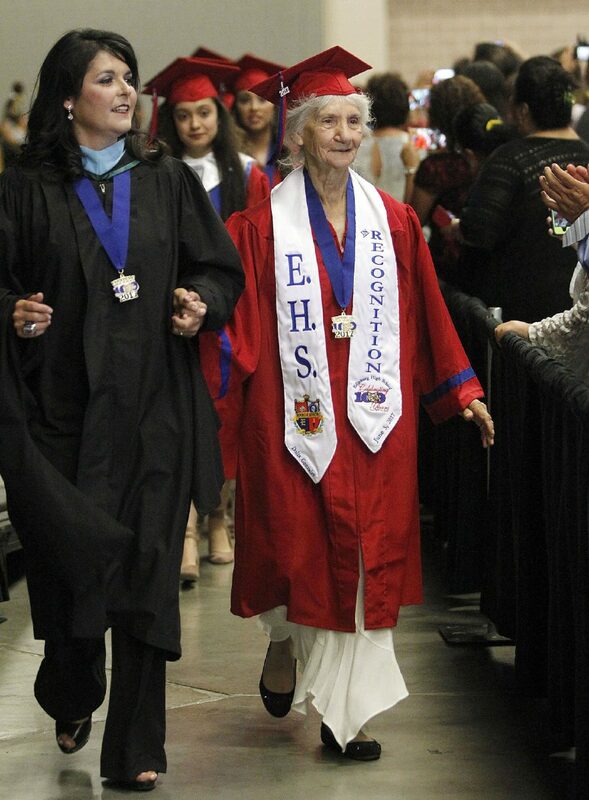 Edinburg High principal Yesenia Molina and Dolia Gonzalez leads the graduates inside the building during Edinburg High School Commencement ceremonies Saturday June 3, 2017. at the McAllen Convention Center in McAllen. Dolia Gonzalez was awarded an Honorary Certificate during the graduation ceremonies for the Class of 2017. Dolia Gonzalez stands next to her niece Emily Acosta, 17, during Edinburg High School Commencement ceremonies Saturday June 03,2017 at the McAllen Convention Center in McAllen . Dolia Gonzalez was awarded an Honoary Certificate during the graduation ceremonies for the Class of 2017. Jessica Acosta, 23, Dolia Gonzalez and Emily Acosta,17, sit with their aunt Ms. Gonzalez backstage before the Edinburg High School Commencement ceremonies Saturday June 03,2017 at the McAllen Convention Center in McAllen . Mrs. Dominga Vela, wife of the late coach Robert Vela, congratulates Dolia Gonzalez for her Honorary Certificate on Saturday June 03,2017 at the McAllen Convention Center in McAllen. She had a few words of advice for the class. “I tell them take a good direction, educate themselves,” Gonzalez said. “I still work. 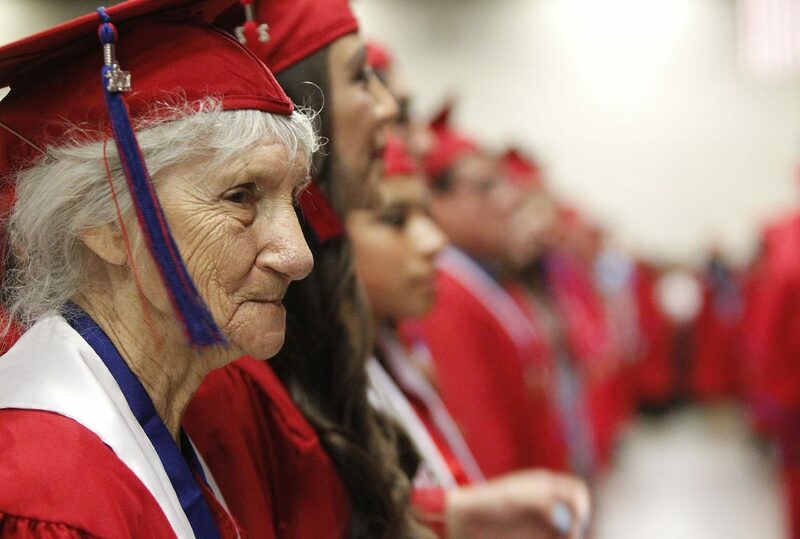 I’m going to be 88 years old and I tell the girls: go to college, finish college. I didn’t do it. Look at what I’m doing now. “If I can do it so can they,” Gonzalez added. Since his death, his mother, Dolia Gonzalez, has received several awards and honors on her son’s behalf, including the Medal of Honor; an Edinburg street was named after him in 1969; an Edinburg school district campus was named after him in 1975; and a warship named after him 1995.